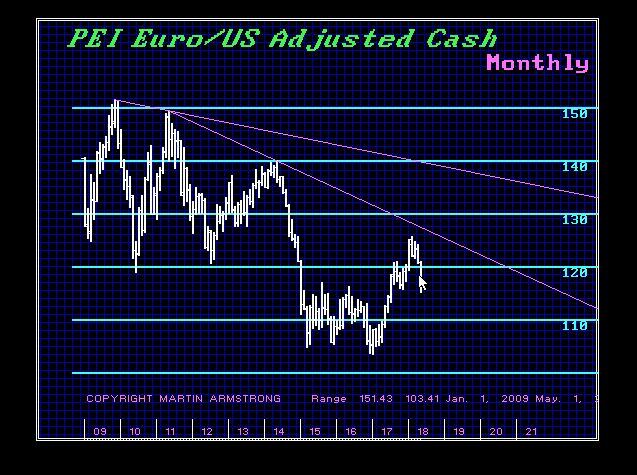 QUESTION: Mr. Armstrong; You have obviously been correct on the Euro. You even called the bounce but it stopped at 1.2550 and did not reach your ideal target of 1.28. You are saying that interest rates in Europe are more likely to rise faster than the ECB predicts. The French central banker Francois Villeroy de Galhau has also come out and said that a hike in interest rates from mid-2019 onwards will be possible. That contradicts Draghi. Running a small business here in Europe is difficult as you know. So we should look to try to lock in rates now before it is too late. Correct? ANSWER: Absolutely. True, the technical resistance and the Monthly Bullish were in the 128 zone. However, the euro just did not have enough energy to reach that point which is in itself an indication of inherent weakness. If we look at the long-term 30-year rates on the euro, support lies at 0.93% and resistance at 1.7%. A monthly closing above 1.7% will signal a move up to 2.33% to 2.43%. After that, expect a rapid move to 5%. A closing at year-end above 1.42% will confirm a sharp rally is underway.